At the Mittel Sports Injury & Treatment Clinic, our partner business, we've been successfully treating sports, workplace and lifestyle injuries for over 40 years. We use the latest soft tissue manipulation techniques & equipment, including Laser, Ultrasound & Infrared, to ensure that we can safely alleviate your pain or condition. Click here to give us a call to book an appointment. 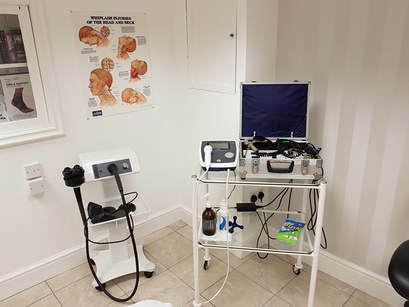 To find out more information about our treatment methods and our qualifications, please visit the Mittel Sports Therapy Clinic website or, if you would like to discuss your injury or symptoms over the phone, or book an appointment, please call us on 01904 626566. We find that clients wish they could have asked us before booking and appointment or before arriving to see us, so we've compiled the most common ones for you here. Your initial consultation will take an hour, unless it is a minor skin or wound condition. The session will involve taking a comprehensive history of your injury to enable the best treatment plan for you. The rest of the session will be applying the appropriate treatment method ensuring you’re well on your way to recovery. GP referrals are not required, but we are happy to work with your GP as part of your treatment plan. Our treatments are covered by most Health Insurance plans, but you will need to confirm with your own provider. It is generally advisable to wear loose clothing to ensure that we can easily access the area where treatment is required. We accept credit card and cash payments. We prefer that you give us at least 24 hours notice if you need to cancel your appointment.